Lena Levin. Silentium (after Osip Mandelstam). 48″x72″. 2012-2016. Oil on canvas. 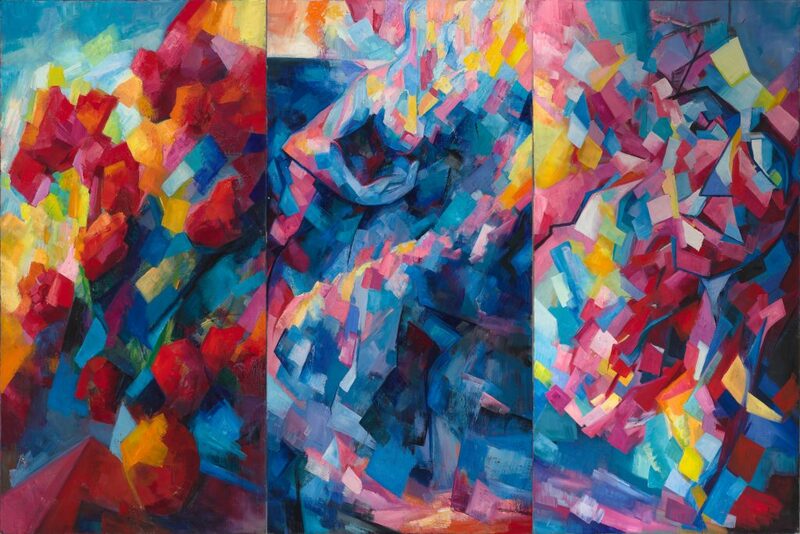 Looking back, it is hard to believe how long this painting — this triptych — had stayed with me. It began in October 2012, when I decided to paint “The birth of Venus” — a study after Titian, now buried under the roses of the first painting. And it was only in April 2016 that the whole triptych declared itself complete (and asked me, not too politely, to leave it alone). And it’s only now — while editing the final photos of these paintings as a part of my slow review of 2016, that I am beginning to glimpse its role in the overall drama of my life. It has to do with the fear of freedom. I sense this fear in myself as I review my year — reading my journal month after month after month — and seeing how the flow of inspiration is being blocked again, and again, and again, by the scaffolding of self-discipline, daily routines, weekly and monthly plans — the scaffolding I thought necessary to keep my life (and work) together, mistrusting both myself and life that wants to express itself through me. And enterprises of great pitch and moment — with this regard, their currents turn awry, and lose the name of action. It is a society of laborers which is about to be liberated from the fetters of labor, and this society does no longer know of those other higher and more meaningful activities for the sake of which this freedom would deserve to be won. What we need, then, is not “more jobs”, but the reclaimed ability to live in the realm of freedom — and not to run away from it into self-imposed busyness. What does it have to do with Venus? I had struggled with my Titian study for a very long time before I finally understood that the source of all this struggle was my discomfort with — if not downright hatred towards — the very archetype of Venus, with its connotations of seductive power and its twin, objectification. And this hate expressed itself into burying every hint of Venus under roses; the canvas was now called “The death of Venus”. But the motive — the theme itself — was far from over. It hadn’t resolved itself with this symbolic death of Venus — neither in my work, nor in my life. I have always been kind of androgynous — people took me for a boy well into my twenties; and it was easier for me to be friends with men than with women. But all in all, I was fairly comfortable with my femaleness, and quite happy in my intimate relationships with men, all of which grew out of friendship. If I had any power of seduction, I did my best to keep it in check (for example, I never dyed my hair — even though it was visibly grey from a very young age — or used any make-up), and I was proud of this (still am, as a matter of fact). But there was a downside to this rejection of Venus: I almost never allowed myself to truly trust my intuition, giving preference to the power of my mind whenever possible. And in painting — as in art in general — this translates into blocking the flow of inspiration with dams designed by the mind. It was Osip Mandelstam’s poem, Silentium, that finally helped me realise this connection, when, several years ago, it floated to the surface of my mind from the recesses of childhood memories. A poem about essential identity between the birth of Aphrodite and the birth of a poem — and art in general, and, ultimately, life itself — it is this poem that engendered the triptych: “The death of Venus” — “The birth of Aphrodite” — “Silentium”. But the tension hasn’t fully resolved itself yet, even though the painting is complete. Throughout 2016, my mind kept building a prison of busyness around me; rereading my journal, I can hardly believe how often it didn’t let me stay with insistent impulses of inspiration — because my cherished self-discipline forced me into doing something else. Because I was afraid of freedom — and the current of inspiration turned awry and lost the name of action. This is the prison I want to dismantle completely in 2017.